Can Fatty break St. Patrick Roy's record on St. Patrick's Day? or will Chicago's snipers have their way with him? Chicago is 8-4-3 against the East. New Jersey is 10-5-0 against the West. The JOKESPN Ombusman: "It is too late for ESPN to dial it back or dumb it down, too late to satisfy the savvy core audience it created with the thin gruel of sound bites, shouting heads and the celebrations of the obvious. If it wants to sustain its success, ESPN has no choice but to keep getting smarter. Its audience demands it." Cycle Like the Sedins: "At this point, I love NHL Network to the point that if it beat me up, I'd be back the next day with sunglasses to mask my black eye and a fresh "I fell down the stairs" excuse. Yup, it's my umbrella." Zorak's Magic Numbers: Detroit and San Jose have clinched playoff spots mathematically, but the Bruins magic number is only 4. If Carolina (tomorrow vs. NJD) and Buffalo (tonight vs. OTT) both lose, and the Bruins win vs. the Kings on thursday, then the bruins will have officially Clinched and I'll be taking my before-playoff-beard picture. 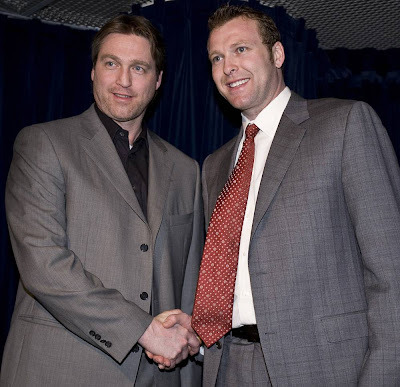 Matt Kalman: Talks to Thomas and Manny about MB30 "If you look how Marty Brodeur plays, he has his own, totally unique style — which doesn’t get talked about that much.” said Thomas"
Jeremy Roenick: "I grew up playing at that golf course. It was always one of my favorite places. I never could have thought that one day I’d be in position to buy it."